Just one year into the life of Putney & Wimbledon Brass Band it seemed the right time to throw a party. With a list of achievements as long as our shiny green ties, we have a lot to celebrate and – to be honest – we love any opportunity to play. 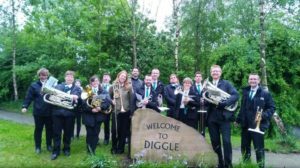 Our enthusiasm for #brassbanding is infectious; with every outing in the community we gather new followers and spread the brass band love. Tonight was the perfect event. Having entered the Community Church in Putney at 8pm – with the Mayor of Wandsworth in attendance – those members of the audience new to brass banding would be forgiven for expecting a calm, quiet and reverent start to our concert. However, our opening number Barnard Castle did make the audience wake up and sit up! 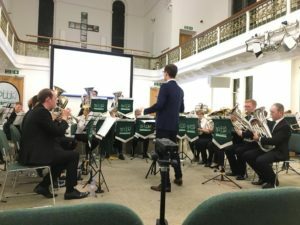 By the time we hit the first note of Trailblaze, they were well prepared for this explosive and entertaining piece; moving through every dynamic, from the euphoniums tiptoeing lightly over the top, to trombones blazing their way through the whole band. The most beautiful and moving of all pieces of the evening – a classic hymn Crimond known to all as “The Lord is my Shepherd” – opened with soloist & principal cornet Nicholas Scholfield bringing a few tears to the audience with his sublime playing; definitely a fitting venue to allow the church acoustics to reflect the emotion of this evocative piece of music. 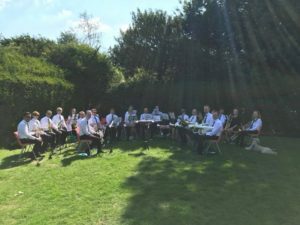 Travelling through the different genres, we marched through Sturminster High, and soothed ourselves with the classic hymn I Vow To Thee My Country. We then sprung into movie theme Born Free and onto Anthem from the musical Chess. We rocked to Queen’s Bohemian Rhapsody and had some of the audience head-banging in their seats. Our drummer, Joseph, could be forgiven for making this his favourite piece of the evening, though he probably needs to grow his hair a little longer to look the part! We eased gently into the beautiful Calling Cornwall sunrise; music that took us on a journey through the Cornwall landscape. That was one of our four Goff Richards compositions of evening and we managed to squeeze in Still Time. To prepare us for the tempo, our MD Sam Topp gave us his signature hip wiggle to settle us into the driving rhythm of this entertainer. Just watching Sam enjoy this Goff number was probably entertainment itself. Our youngest piece of music composed by Justin Bieber and Ed Sheeran was Love Yourself, with soloist Andy doing the loving from the onset! No birthday party is complete without a cheesy ending, and we literally struck gold with an arrangement of classic ABBA hits from Alan Fernie to round off the party with ABBA Gold. With every event, we try to make the right choices; right for the band and right for the community. 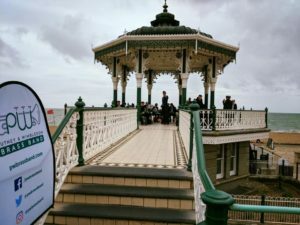 We also thought about our refreshments being right for the planet and – from a concert with over 100 people attending – we created only a tiny bag of waste; everything else was either eaten or recycled! As Martin Smith said after the event: “Our concert was a success – much less rubbish than expected!” … not sure that is our perfect strapline but – on an environmental level – we will take that! A wonderful evening for everyone involved, thanks to: the Mayor of Wandsworth for celebrating with us; Community Church Putney for providing the venue; members of the audience (especially those who came to their first Putney & Wimbledon Brass Band concert); members of the band for compering, arranging the venue, and organising refreshments; and finally our dedicated Musical Director Sam Topp for preparing us for this evening. 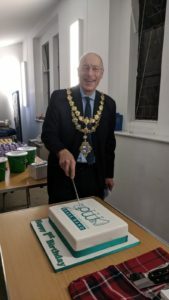 A great celebration for our first birthday … we are looking forward to a bright brass banding future in Putney and Wimbledon! Putney & Wimbledon Brass Band are celebrating because – can you believe it – we’ve been in existence for a year already. And what a year it has been! Bandstand and the villages around Saddleworth (for Whit Friday, one of the largest brass band competitions in the Country). We started literally with a bang as our first official gig was the Wimbledon Park Fireworks extravaganza; just a few of weeks after our first rehearsal and we played to a crowd of several thousand. Not a bad start! 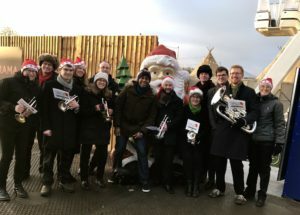 Through the 2017 Christmas period, we put our Santa hats on and headed out across beloved communities, playing our socks off for commuters, Christmas light switch-ons, Community Choruses, public house revelers and church congregations. On top of that we even managed to play on live TV in front of the nation as they ate their respective breakfasts whilst watching Good Morning Britain and Lorraine. 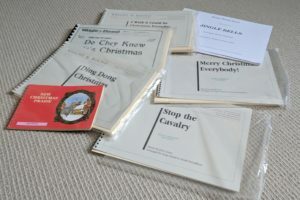 Christmas cheer had never been so brass-centric. embraced brass music into their celebrations and events throughout the entire year. Not only have we more than doubled the number of musicians in the band to well over 30; we have played at cycle races, rowing races, marathon runs, birthday parties and community church events; we’ve played for schools, pubs, choirs, Guide Dogs, Members of Parliament, NCT Groups and Mayors; we have played on stages, streets, Commons, Moors, gardens, next to the river and by the sea. 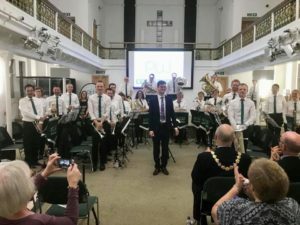 It seems like only yesterday that a group of brass players decided to take their art form to the communities of Putney & Wimbledon, and those communities have certainly taken us – and brass band music – to their hearts. Thank you. What do you do when you reach the grand old age of 1 year old? You have a party – of course – and you invite everyone along! So you are cordially invited to join us on Thursday 11th October. he is something of a fan. We look forward to seeing you on 11th of October, starting at 8pm and continuing on until around 9:30pm, in the lovely Community Church Putney, Werter Road, SW15 2LL. Come along, let us say thank you, and help us celebrate. And don’t worry; it’s a birthday party, so there will definitely be cake!